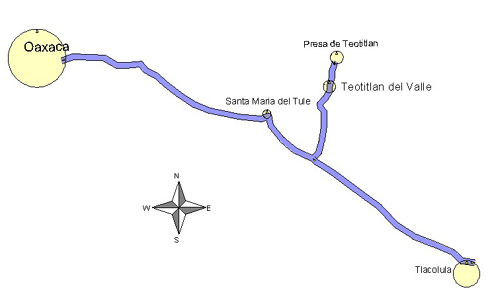 (17°01.8'N 96°31.2'W) is 24 kilometers (15 miles) southeast of Oaxaca City, off Highway 190, not far past Santa María del Tule and the wonderful Tule Tree and 10 kilometers before you reach the Sunday market town of Tlacolula. Turn off the Highway and drive toward the center of town, about 1.5 kilometers. 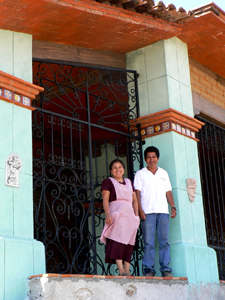 Jacobo Mendoza's gallery is located on the left, a lovely turquoise building with iron grill gates.